: The ancestry of the Chow is attributed to China where he was kept as a guard dog, and also used for hunting. 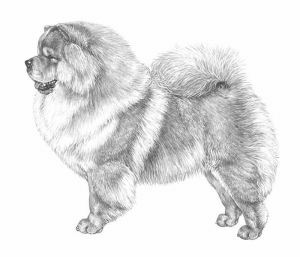 The Chow has been known in China for upwards of 2,000 years and is related to Spitz dogs of the Nordic type, also containing something of the mastiff. Because of China’s ‘closed door’ policy to the rest of the world Chows did not begin to appear in other countries until around 1800. He made his way to England sometime during the late eighteenth century and was not really noticed in Britain until the 1920s, with a number being shown at Crufts in 1925.
: Active, compact, short-coupled and essentially well balanced, leonine in appearance, proud, dignified bearing; well knit frame; tail carried well over back. Should always be able to move freely and must not have so much coat as to impede activity or cause distress in hot weather. A bluish-black tongue is characteristic. : The distance from withers to elbow is equal to the distance from elbow to ground. : Quiet dog, good guard. Independent, loyal, yet aloof. : Large and wide in all cases, black (with exception of cream and near white, in which case a lighter coloured nose is permissible, and in blues and fawns a self-coloured nose (but black preferable in all cases). : Moderate in length, broad from eyes to end (not pointed at end like a fox). Well filled out under the eyes. : A solid black mouth including the roof and flews, with a bluish black tongue is ideal. However, some dilution may be evident in the gums of blues and fawns and this dilution may be more pronounced in creams and whites. : Teeth strong and level, jaws strong, with a perfect, regular and complete scissor bite, i.e. the upper teeth closely overlapping the lower teeth and set square to the jaws. : Short, level and strong. : Broad and deep. Ribs well sprung, but not barrelled. : Equidistant between withers and ground. : Perfectly straight, with good bone. : In profile the foot is directly under the hip joint. : Hocks well let down. From hocks downwards to appear straight, never flexing forward. : Relatively short striding, hind feet not lifted high, appearing to skim the ground, resulting in pendulum like action when seen in profile. Its distinctive short-striding gait allows it to move freely, never lumbering and with excellent endurance. Forelegs and hindlegs moving parallel to each other and straight forward. Dogs should always be able to move freely and soundly without any sign of distress. Males 48 - 56 cms. Females 46 - 51 cms.